While there are numerous models of manual medicine, several of these models have more than one approach. We will address the functional approach of the biomechanical model. The biomechanical model assesses and treats structure or function. The functional approach assesses function and its influence over structure. In other words, the functional approach views structural misalignment or asymmetrical configuration as function gone awry (dysfunction). We will utilize the letters SD to denote somatic dysfunction; these letters will always precede a descriptive anatomical state of altered function of the muscular skeletal system. Somatic usually refers to the muscular skeletal system (fascia, muscle, bones, joints, ligaments, and discs), as well as the related components of nerves, and the abilities to conduct respiration, vasal circulation, and lymphatic drainage. This obviously affects the function of the viscera. Therefore SD or somatic dysfunction should be considered synonymous to, but not superior to nomenclature for segmental dysfunction, subluxation dysfunction, osteopathic lesion, or when referencing non-spinal bone misalignment structural deviation. References to that nomenclature are intended to engender specificity of diagnosis or assessment and to assist the reader who may know that condition by only that certain name (such is the case of a subluxated rib). This term has universal application within the medical, osteopathic, and chiropractic fields of study. The other terms, while analogous, are somewhat proprietary in nature. Therefore, for our purposes, SD is an attempt to standardize nomenclature and can be used interchangeably for any of the above-mentioned terms. Most practitioners and insurance companies consider SD as a symptomatic assessment or diagnosis due to the subjective nature of the physical findings. Structural deviation or misalignment can be determined through radiograph, which is objective but frequently fails to identify the mechanical influences responsible for that structural deviation. Therefore, practitioners whom rely on laboratory interpretation to the exclusion of a comprehensive physical assessment can overlook the etiology of these somatic conditions. Conversely, stealth like systemic disease processes can be initially misdiagnosed as minor somatic conditions, when extensive diagnostics are not employed following a person's failure to respond to the initial care. This occurs when a practitioner is either unfamiliar with the perpetuating mechanisms of myogenic dysfunction or has not taken the time to thoroughly evaluate the history of the present illness. Therefore, Dr. Greenman's diagnostic triad of A.R.T., representing Asymmetry of form and function, Range of Motion, and Tissue abnormality, should probably be preceded with a P. for Perpetuating factors and process. While soft tissue is slow to respond to care, it will progressively get better providing that the perpetuating factors have been eliminated as long as the trauma was not severe. As a manual medicine or somatic practitioner we are concerned with hypermobility as well as hypomobility. Hypermobility is usually the result of ligaments that are lax. This frequently is observed in premenopausal females which have a higher preponderance to SD due to the integrity of the joint capsule being compromised. Therefore even subtle movement with normal tonus can create structural translation with possible biomechanical peripheral nerve compression ensuing. Hypermobility is also observed in person's who have experienced sprain strains, whiplashes, or also in some connective tissue diseases such as Ehlers-Danlos and Marfan's syndrome. Hypomobility is usually the result of shortened muscles. The hypertonic muscles in tandem with fascia, which is a binding mechanism, while initially asymptomatic will restrict motion, deviate structure, fixate structure, develop trigger points and compress or entrap nerves, blood and lymphatic supply. Hypomobility may be the result of less frequently observed causes such as severe arthrosis, prosthetic implants, trauma, edema, adhesions, and neoplasm. Hypotonicity usually results from the under utilization of a muscle or group of muscles, or it may be the result of neuromuscular disease or previous trauma. However, when muscles are traumatized they normally enter into a neuromuscular dysfunctional state and after a period of time become dystrophic in nature with a palpable hypertonicity or induration being evident. This indurated or harden muscle is ischemic and will not allow oxygen, nutrients or metabolic waste to transport via the capillaries. Within hypertonic muscles trigger points may form. These myalgic tender spots can be either latent, being clinically silent for pain or active, referring pain to a distant region or producing autonomic phenomenon. Trigger point referral pain, which is discussed by Travell and Simons, do not follow any certain neurologic pathway. However, they may occur within a dermatome pattern with that pattern overlapping into other dermatomal, myotomal, sclerotomal and viscerotomal reference zones. As frequently mentioned, there are numerous models of manual medicine. The examination protocol differs with each one of these models. Our somatic assessment is specific for the functional approach of the biomechanical model. Therefore, we will be identifying structural asymmetry as an indicator of function gone awry. The somatic screening exam should be considered an adjunct to the screening exams offered in the clinical assessment. While the screening and extended exam is somewhat detailed, it should not take more than ten minutes in an office setting to perform the appropriate clinical and somatic assessments. Based upon the preliminary findings of the clinical and somatic screening exams the practitioner should have insight as to what extended clinical or somatic extended exams are required, or if further diagnostics would be needed to rule out conditions which could not be ascertained through physical examinations. The somatic screening and extended exams assess structure through osseous landmarks and soft tissue characteristics. They also determine if these soft tissue characteristics attribute to osseous misalignment, and its possibility of neurovascular compression, or to a neurovascular entrapment, trigger point referral or a binding mechanism restricting range of motion. While there are subtle nuances, characteristics, and considerations associated with virtually every region of somatic assessment, the reader will find them incorporated in that related area. For the purpose of the somatic screening, a less introspective assessment is required. Most jargon germane to manual medicine is the direct utilization of basic medical terminology and points of reference. However, this is not the case with functional body mechanics and listings associated with the vertebra and pelvis. 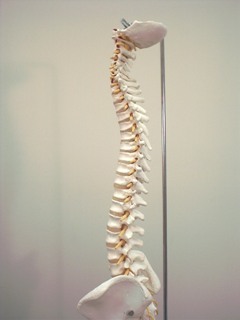 While massage therapists, physical therapists, osteopaths, and manual medicine medical doctors utilize the same structural and functional vertebral and pelvic nomenclature, the listing for the chiropractic community differs somewhat, depending on the treatment techniques to be used. As these structural listings must be uniform for the practitioner to have an affinity as to the goals of assessment and correction, we have outlined in this introduction the structural and functional listings associated with manual medicine assessment of the spine and pelvis. These assessments are derived directly from PRINCIPLES OF MANUAL MEDICINE, SECOND EDITION, written by Philip E. Greenman, published by Williams & Wilkins. Type I: In Type I or neutral group mechanics, the primary and secondary curves of the spine are present and neither flexion, extension, side bending, nor rotation has been introduced. Upon introducing flexion both facets open, the anterior body translates forward and the spinous processes moves anteriorly and superiorly. Side bending and rotation occur to opposite sides. In right side bending, the left facet would open, the right facet would remain closed, and the anterior body would rotate left. Type II: In Type II or non-neutral group coupling, side bending and rotation of a vertebral segment usually occur to the same side. However, these mechanics are not absolute. Type II occurs when either flexion, extension, side bending, or rotation have been introduced, and depending upon which motion was introduced first, and where it occurs in relationship to the curvature of the spine, the given mechanics and translation will be determined. In the lumbar spine, side bending and rotation will occur to opposite sides when flexion was previously introduced. 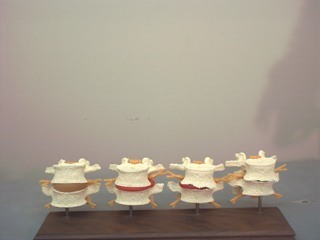 In the typical cervical vertebra, non-neutral coupling is present. Type III: Mechanics are observed through the restriction of normal motion when performed secondary to a previous motion. For example, the range of side bending that can be achieved when the posture is erect is far greater than if it were introduced with the trunk in flexion. While this technically appears to be more a property of motion rather than a definitive mechanical relationship effecting motion, the reader should note that other writings may allude to type III. (Principles of Manual Medicine, 2nd Ed. The spine consists of seven cervical, twelve thoracic, five lumbar, five fused sacral, as well as a fused coccygeal segment. Each innominate, or hemipelvis, is comprised of a fused ilium, ischium, and pubic bone; they attach to the spine at the polyaxial sacroiliac joint. Like the intervertebral articulations of the vertebra, the SI joint may become fixated in either an open or closed manner, thus prohibiting normal pelvic translation. Restrictions to motion may be classified either as a pathological or anatomical restriction. Pathological barriers are those barriers to motion, whereby an individual can no longer increase motion beyond a given point. Anatomical barriers, which are also called absolute barriers, are the range in which tearing of muscle; ligaments, fracture, or dislocation would ensue if motion were to be continued beyond that restriction. The functional model attempts to eliminate restriction, thus enhancing motion and improving the pathological barrier. Most manual techniques use one of several direct methods of increasing motion in the direction of motion lost. However, indirect techniques may be employed to balance the system, which will increase motion as well. There are essentially two forms of activation forces. Intrinsic activation requires the individual to initiate an action after being positioned by the practitioner, such as a muscle energy technique or proprioceptive neuromuscular facilitation. Extrinsic activation would be a corrective force applied externally, such as a form of manipulation or the use of gravitational forces, as in sacral occipital technique. As we all know the pelvis consists of two hemi-pelvis or innominates, which are formed by one fused ilium, ischium and pubis. They articulate anteriorly at the symphysis pubis and posteriorly, and independently to the polyaxial sacroiliac joint of the sacrum. Due to this polyaxial L shaped articulation at the sacrum, mechanical influences can provide you with a wide array of osseous configurations or alignments. While most descriptive terms are rather straight forward, such as an elevated pubis, or an elevated innominate, terms such as a pelvic inflare, outflare, or sacral shear may not be terms that you currently incorporate into your clinical jargon. As these conditions are constituted by a wide array of concomitants, they will be addressed within their respective region. Type I consists of three or more dysfunctional segments which are side bent and rotated to opposite sides. Upon bending or standing erect, the dysfunctional segments may slightly improve or worsen, but will never become symmetrical. If numerous segments are involved, the symmetrical configuration appears to be Scoliotic, with a pronounced fullness of the lamina groove, and the normally non-palpable Multifidus is distinguishable. This single segment dysfunction usually precedes a Type I dysfunction. It is named according to the superior segment over the inferior segment of involvement. For example, a misaligned Type II C7-T1 would be named C7, and possibly cause a biomechanical peripheral nerve compression of C8. This is due to there not being a C8 vertebra, but there is C8 nerve supply due to the numbering of the spinal nerves. Type II single segment dysfunctions are side bent and rotated to the same side, and will obtain symmetry either through flexion or extension. If the facet is fixated or locked open, flexion will gain symmetry of structure, and extension and side bending towards the fixated side will be diminished. Conversely, if the facet is fixated or locked closed, extension will have structural symmetry, but flexion and side bending to the opposite side will be diminished. Due to the translatory relationship of the vertebra, there will be a palpable fullness on one side of the lamina groove as compared to the other, which obviously is most marked in a flexion lesion when erect or hyper-extended, or in an extended lesion when flexed. This fullness is created not only by hypertonic muscles, but by a translated transverse process. If the transverse process is rotated to the right, there will be a left rotated spinous process, and a right rotated body. 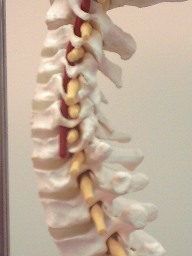 Usually, the somatic pain complaint will be manifest on the side of which the vertebral body is rotated towards.